Yoga mats are the must-have accessory for all yogis. Generally any yoga mat is good for most practices, but when it comes to portability or travel, a standard yoga mat doesn’t fit the bill. They’re bulky and have to be rolled and carried in a special bag or on a strap. While that may work for most day to day use, it doesn’t work well if you go to your yoga class on your lunch break or straight from the office. And what about traveling? Forget about it. A regular yoga mat will not fit in a carry-on bag or even most suitcases. That’s when travel yoga mats become a great option. These travel yoga mats are made to be super compact and lightweight. They’re perfect to pack in a suitcase for long trips or in a gym bag for when you’re heading out to your yoga class. Available in a variety of materials and colors, you’re sure to find something that fits your need. Check out our recommendations below. This foldable yoga mat from Gaiam is a great option for the yogi on the go. At 2 millimeters thick, this mat is scored to fold down to only a 10″ x 12″ rectangle that will easily fit in your suitcase or gym bag. The small size does not sacrifice quality. It still has the sticky texture you expect from a yoga mat, ensuring stable footing for yoga postures anywhere. Use this mat for weekend yoga retreats, to take on business trips, or to make it easy to head to yoga class with your mat in tow. 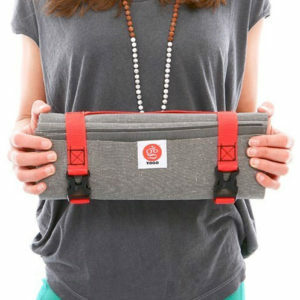 If you’re looking for a super light and eco-friendly yoga travel mat, this one from Yoga Design is great. It’s a combination yoga mat and towel, perfect for sweaty yogis and hot yoga classes. It features the cushion of a rubber base and a microfiber layer to absorb sweat and give you a firm grip. These mats are eco-friendly, made from natural tree rubber and water-based print inks, which means they are bio-degradable. If you usually use a towel on top of your mat, this is the best travel mat option for you. This mat is machine washable to keep it fresh and folds up to fit in your carry-on or tote bag. You can also roll it and carry the combo mat with the included strap. Comes in 10 different gorgeous colors and designs. These mats are like a unique work of art. If you’re a fan of Jade Yoga mats, you will love their travel version. Their travel yoga mat, called the Jade Voyager, can roll up or fold to be about the size of a yoga block. This makes the mat perfectly portable for travel or heading to yoga class. The mat is light and thin but still has the stickiness you need for a reliable yoga practice anywhere. Made from natural rubber, Jade plants a tree for every mat they sell to help reduce their ecological impact. If you’re looking for a portable yoga mat that comes with a carrying case, check out the YoFoMat. This mat is thicker than other travel mats at 4mm so it gives you a little more cushion than the other options. (One side effect of the thicker material is that the mat weighs more than other travel yoga mats.) This is a high-density mat that is made from non-allergenic and non-toxic materials. The mat is non-skid on both sides for a safe yoga practice and it folds so the floor side does not touch the body side of the mat, keeping it cleaner. The fold lines are also positioned to help with alignment in your poses. This mat is great for yoga, pilates, or a soft cushion during meditation. Comes with a travel bag for easy portability and a yoga pose chart. This mat from Manduka is another fantastic eco-friendly travel option. made from biodegradable, natural tree tubber (not harvested from the Amazon), it’s 99% latex free and safe for use by people with latex allergies. Manduka also uses a zero waste manufacturing process. This mat easily folds or rolls to pack in a suitcase or gym bag. Some reviewers say the mat has a very strong smell when first opened, so you may want to air it out. It comes in 7 different bright and brilliant colors, so you’re sure to find one you love. This is hands down the most compact yoga mat we have ever seen. The YOGO travel mat folds down to the size of a towel, perfect to fit in a large purse or carry on bag. It also comes with a carrying strap to make it even more portable. This mat has a sticky surface on both sides, but their patented origami design helps to keep the top surface clean for your practice. If you like to wash your mat on the go, the straps double has a hanging system to wash and dry in the shower. Made entirely of natural biodegradable tree rubber and recyclable plastic, YOGO also plant a new tree for each mat sold. The rubber is harvested from sustainable plantations in Asia and no the Amazon. Unfortunately, they do not offer any color options besides gray, but thanks to the compact size, it may be worth the trade. Like to do meditation on the go? Check out our recommendations for portable meditation benches for travel. If you’re looking for a meditation pillow that’s more portable, check out travel meditation cushions and mats. Enhance your yoga practice at home with yoga props, benches, and chairs.